If you’re looking for a fresh and exciting approach to sightseeing, look no further than this classic bus tour of London! Combining theatre and technical trickery with an insightful look at London's rich past, it's ideal entertainment for all the family and suitable for all ages. Step aboard the incredible 1960s Routemaster bus and embark on a state-of-the-art sightseeing experience. With the addition of video cameras, plasma screens and some superb speakers, the bus is all set up to guide you through the beating heart of London on a marvellous journey exploring both the exciting history AND future of London.Your sightseeing tour of London will begin on Northumberland Avenue, and from there passengers will have front row seats as the hand-picked comdic guide talks through his favourite fascinating tales of London's history. The tour will go past Buckingham Palace, Trafalgar Square, Westminster, the Thames, Parliament Square and much more, as well as covering topics from Kings and Queens to the Great Fire of London. What better way to learn about the capital than from someone who knows it like the back of their hand?! So what are you waiting for … there’s no time like the present. Or is there?? 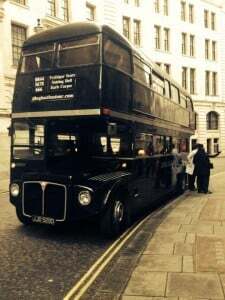 The Classic Sightseeing Bus Tour of London is available 7 days a week, throughout the year. Please note that there is no wheelchair access on the Time Tour of London. 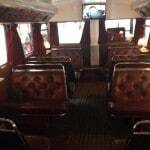 The Classic Sightseeing Bus Tour of London lasts for approximately 1hr 15mins. Participants: The Classic Sightseeing Bus Tour of London is for 1 participant. Weather conditions do not usually restrict your Classic Sightseeing Bus Tour of London; if there is heavy snow and the tour needs to be cancelled, you will be able to reschedule. On a drizzly day in central London, you may find yourself not too keen on walking the puddle-filled streets in order to see the sights. 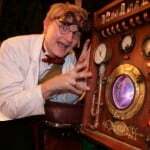 Sharing this sentiment, Poppy and I embarked on a whole new way to tour the city – ‘Time Travel Tours’. The tour has been previously described as “a journey through London AND through time,” which it most definitely is. A self confessed Doctor Who and sci-fi nerd as well as a lover of this amazing city, it’s safe to say I was looking forward to the tour. 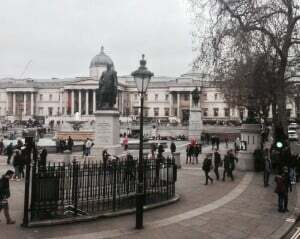 We were picked up by the Time Travel bus a short walk from Trafalgar Square and immediately greeted by the eccentric tour leader Professor Quantum, whose name was the first – but by no means the last – pun of the day. 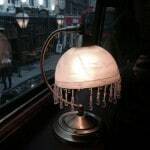 All customers were shown up the stairs, where the décor was a Victorian twist on the traditional London double decker’s, complete with a jeweled lamp and velvet curtains next to every seat. 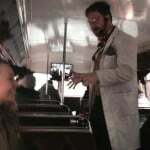 The only thing distracting from the theme were the televisions at the front and rear of the bus, which were used to ensure that all travellers could see the Professor at all times. The Professor led the tour with enthusiasm and unwavering energy. Having assumed the experience was mainly aimed at families we were surprised to discover that there were more adults on the tour than children. This can partly be accredited to the Professors’ endless knowledge of London history. Covering famous events from the Battle of Trafalgar to The Plague, the variety of history was truly remarkable and we came away feeling we had really learned something. 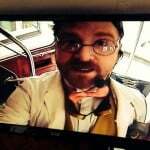 The bus itself was our time machine, complete with robot driver ‘Metal Face’ and on screen visits from William Shakespeare and Samuel Peep’s scullery maid, amongst others. As we drove around famous locations we were constantly entertained with witty anecdotes about the Professor’s own contribution to English history (the ending of Romeo and Juliet was his idea apparently!) and he made sure to interact with everyone on board individually. Consequently I soon found out that when asked what event I wanted to travel back to, ‘The Great Fire of London’ was not the traditional answer! This tour is a unique way to learn about London’s fascinating history and is unlike any we have ever come across. The company runs a tour every day of the week, each lasting just over an hour. 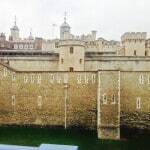 Locations visited include Tower Bridge, Shakespeare’s globe, 10 Downing Street and many more. 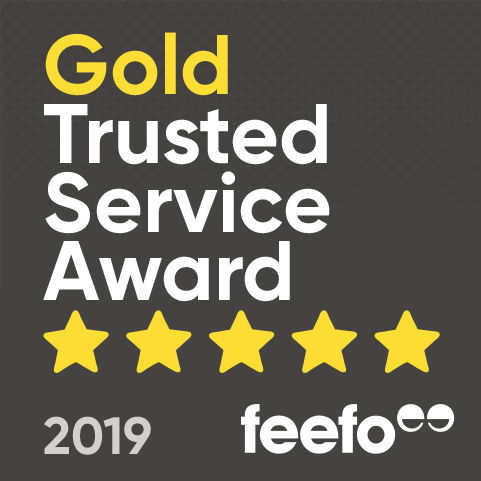 Contrary to our initial presumptions we are confident that people of all ages will enjoy this fascinating journey through time in our nation’s capital. What time does this tour run?